So far, the Wonderfully Wicked Read-a-thon is going way better than I would have imagined! 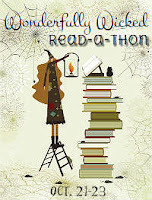 This is a challenge hosted at LovelyLit as a part of the Read-a-thon. "For this challenge you will be making one sentence using only book titles. You can't add or leave out any words. You can use as many books as you like. Your sentence will probably be silly but that makes it even more fun! Just make sure it's a real sentence. Subject & Verb!" Only time will tell, if on a winter's night a traveller abandoned the time traveller's wife forever in the land of winter. the second name was a very convenient find! SS - Hey, I have read it, you know... I heard of the challenge and "If on a winter's night a traveller" was the first thing that came to my mind! !